Through a series of seemingly unrelated events during the week preceding Thanksgiving, I ended up with a 15-pound frozen turkey that quickly took up residence in my refrigerator. Fortunately, I had already agreed to host the T-Day party, so it made it even easier that the bird remained in my kitchen. Unfortunately, my party only consisted of 4 people (including me), so a 15-pound bird was closer to overkill than horn of plenty. 15 pounds of fowl, even after wrapped up in Ziplock containers and sent home with the other guests, still makes for a lot of extra food. So what does a pie blogger do in such a situation? She makes pies! Turkey Pot Pies, to be exact. I used a frozen, pre made pie crust (Pillsbury), which I personally think is just fine if you don't have the time to make a homemade crust. Preheat oven to 400 degrees. On the stove top, begin by melting the butter in a heavy-bottomed pan. Add the carrots and scallions, and caramelize until soft, about 5 minutes. Add turkey stock, white wine, flour and spices, and stir continuously over low heat. This will create a roux (thickening mixture), and is what gives the inside of the pot pie that light-colored and creamy consistency. The more flour you add and the longer you cook your mixture is what determines how thick your roux is; I like a thicker sauce so my measurements are based on my preferences, feel free to use less flour and/or less stirring time (it's not an exact science). When your mixture is almost at it's desired consistency, add the turkey and corn (both ingredients are already cooked), and stir everything together. Scoop the mixture into a pie plate (I discovered that a heavy-bottomed (ceramic) pie plate works best) and cover with your pie crust, making sure to pinch the edges to seal the crust. 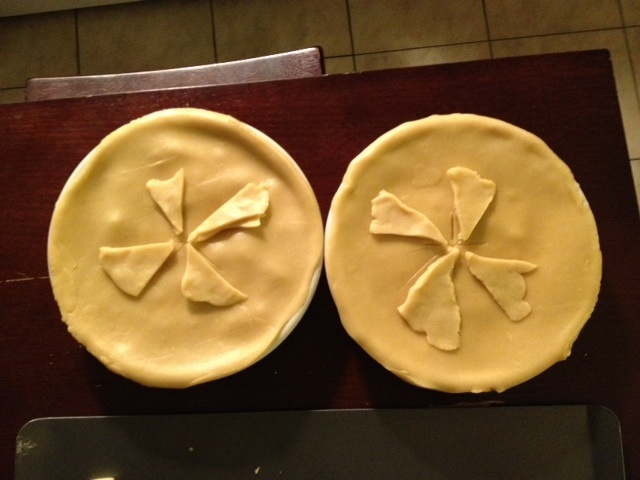 (I ended up making two smaller pot pies due to having a dinner guest, and we had some extra dough from the frozen pie crust, so we embellished a little). It's Thanksgiving Weekend (who says T-Day has to be just a day? Not I.) and I'm actually still too full to contemplate eating any more food, let alone making or trying anything pie related. BUT never fear - I still have a fridge full of food (3 words: 15-pound-turkey) and will be making some delicious leftover creations. Until then, however, I leave you with two pictures of the pies we got to eat this past Thursday. Some explanation: the first pie is a Pumpkin Pie Supreme, homemade by one of my dinner guests. The second pie is a Moon Pie. Yes, a Moon Pie. Why, you ask? Well, I'd like to say that my friends and I have a long-standing tradition of taking one moon pie and cutting it into so many pieces that it feeds the entire party and then some, reminding us of the selfless giving that the first settlers and the Native Americans showed each other so many years ago. In actuality, one of my guests was from out of town and didn't land at LaGuardia until about 20 minutes before the turkey came out of the oven, and decided to contribute the only pie that meets TSA travel regulations. All-in-all, I hope everybody had (and is still having) and wonderful Thanksgiving weekend filled with friends, family, good food, beautiful weather, and as always, delicious pies. Happy Thanksgiving from Macy's Balloon Blowing Up! While spending far too much time trying to get from Point A to Point B the other day, I decided that what my journey really needed was a Pie Break. Luckily, I was right in front of a restaurant I'd been meaning to try when my stomach reminded me that woman cannot live on coffee alone. Hill Country Chicken (located in Manhattan's Flatiron District) boasts authentic Texas-style home cooking (fried chicken, barbecue) along with an extensive pie list, and is one of those places that always seems to get a mention on lists of New York's top pie places. Hmmm. Either they have a really good publicist or I caught them on a really "off" day. While I'd like to believe that they truly do serve fantastic chicken and live up to their slogan of being a "Fresh Fried Chicken Joint," I did not come for their chicken or their barbecue (and, being someone who doesn't actually love fried chicken, would be a terrible critic on that particular subject.) I came for pie. It started out with mild promise. They had a giant sign listing about seven or eight "Pies of the Day," but I only saw three different pies in the display case when I walked up to the counter. They weren't labeled, but after learning they were cherry, coconut cream, and pumpkin pies, I tried to order a slice of cherry (Double Cherry with Streusel Topping, to be exact). The server then told me that only pumpkin was being served by the slice, the other two were being held as full pies. While I love a good pumpkin pie, I knew that I would be eating plenty of that this coming Thanksgiving (one of my invited guests makes a mean pumpkin pie - T-Day pics to come) and had gone in search of anything but pumpkin pie, so I headed for the door. Luckily (or so I thought), I spotted a second display case near the register, and noticed some mini pies that turned out to be for individual sale. I decided upon the apple cheddar (full name: Classic Apple Pie With Cheddar Lattice Crust) because, hey - I like apples, I like cheddar, I should love this pie! Red Flag #1: The server put the pie in a to-go container, I said "oh I'll eat it here," she shrugged and handed me the to-go container. Red Flag #2: The server didn't ask if I wanted my pie to be heated. Dear Food Service Workers Everywhere: People want the option of their fruit pies heated. I know it pains you to go all the way into the back of the kitchen where the microwave is inconveniently kept, and I know you'll endure an awkward conversation with the cook staff while you wait for 1 minute and 30 seconds while the pie is being heated, and I know you'll run the risk of bumping in to your manager who'll again ask if you can work this Friday night, but please, offer to heat the pie. It's like an intrinsic need within people to eat warm pie on a cold day. It makes people happier. Red Flag #3: The server didn't ask if I wanted something to drink, which I did, but couldn't think about due to fluster caused by Red Flags 1 & 2. While fishing for my plastic fork at the condiments counter (and realizing I might have overestimated the level of classy this place had to offer) I saw they had an impressive offering of old fashioned sodas and a few micro-brewed beers I had never heard of, one or both of which I might have tried had someone attempted to sell me a drink. Oh, right. The Pie Itself. Well, it looked good. There was a cute little star-shaped biscuit on top. That was a nice touch. Unfortunately, said five-pointed embellishment was doughy and not worth my time. Nor was the rest of the pie, which had a slightly rubbery top crust, a slightly more rubbery bottom crust, and gritty, cheap-tasting apples inside. Let's just say I had a much better time taking photos of the pie with a new app I downloaded for my phone (still love my phone) than I did actually consuming the pie. Granted, the entire dessert cost about $3, which isn't much in the grand scheme of life. However, there are a bajillion bakeries in the city that serve beautiful little pastries, cookies, candies, cupcakes, truffles, mini-donughts, scones and muffins for right around $3 each. The snack bar has been set high, and it's the duty of every restaurant that offers a quick dessert option to meet, and then hopefully surpass that bar in both taste and service. On my way out of the restaurant I noticed a sign reminding customers to "order your Thanksgiving pies." I feel for anyone who has to spend a holiday with these pies, and look forward to my Thursday of wonderful homemade goodness. This past week, it's clear I've been in a non-traditional, alternative-to-dessert pie mood ("alterna-pie" as it's called by the hipsters, "altπ" for the tech geeks out there). There was breakfast pie, the mac-and-cheese-for-a-quick-snack-pie, and now, some hearty dinner-pie. The dinner had humble beginnings. I was sitting at work, wishing I had brought something more substantial for lunch than a granola bar, and started thinking about what I was going to make for dinner (this is not an unusual situation). Tacos, thought I! Wait. Think bigger. Think better. Think...taco pie. Disclaimer: I was born and raised in a Chicago-Italian family, and therefore have no intrinsic knowledge of anything Taco. However, I like tacos, and every once in a while I manage to combine tasty ingredients in such a way that they form a very edible creation. In a large pan, brown the meat, onions and mushrooms until fully cooked. Add the taco seasoning according to the packet's directions. Brush the inside of the pie plate and both sides of the tortillas with vegetable oil. Place one tortilla in the pan, set the other aside for later use. Layer ingredients in the tortilla shell - ground beef mix, salsa, sour cream, cheese (bottom-to-top). Lay the second tortilla on top of the entire pie creation. Since the tortillas are already cooked, you won't able to seal the edges of the two crusts together like you usually can with an unbaked pie crust, but the soon-to-be melted cheese will seal the top crust to the pie very nicely. Bake for 10-15 minutes, or until top layer is browned and crispy. Again, the final result was really tasty but a bit messy, something I hope to fix in later iterations of both this and any other pie I make. But, it was a fairly quick and easy pie to make and a fully sufficient and substantial dinner. Pies often combine some of our favorite ingredients and other foodstuffs into a manageable, wedge-shaped, crusty-flakey kind of concoction. You like apples? Then stuff them between two layers, add some cinnamon, warm it up, and presto! You've got yummier apples. Same goes for berries! And pumpkins! And macaroni! And then sometimes, in the least likely of situations, a pie will come out of nowhere to combine every favorite ingredient and meet every emotional need you never thought you had. Hungry? Had a bad day and need happy-good-feelings-comfort-food but you're 500 miles from your mother's kitchen? Need a piece of pie? Let me introduce you to the wonders of Tuck Shop, serving what they call The Great Aussie Bite. Now granted, I'm from Chicago, not Australia, so maybe that mention of my mother's kitchen doesn't really make a lot of sense. But regardless of my origins, comfort food is comfort food. And at said Tuck Shop, I was able to order something I had heard about and long been meaning to try, the mother-of-all-comfort foods - a macaroni. and. cheese. pie. Literally, macaroni and cheese baked into a pie crust and covered with more cheese. Not for the faint of heart. Or those on a diet (but I didn't get into the pie blogging business to discuss weight-loss pies). Oh, and there's also corn baked into the pie, which was a lovely surprise, or at least that's what I'm conditioned to think due to a childhood spent with a father whose cooking apex culminated with [Insert Meat Here] Surprise (secret ingredient: corn). Laura behind the counter was serving some fresh-made Thai Basil Lime Soda (and when I say fresh-made, I really mean fresh-made - she was juicing more limes in between making the drinks), which added a refreshing levity to the bulky weight of the pie (note: these pies are small in size but they are a full meal. Come hungry). Oh, a little back story on the shop itself - while devouring my pie, I learned that a "tuck box" is an Australian lunch pail. Keeping with the down-under theme, they serve other Aussie fare (meat pies, lamington sponge cake, Coopers beer, etc. ), but it's not an extensive menu. There are actually three different Tuck Shop locations in NYC, I visited the one at St. Mark's Place, and it lived up to it's lunch pail allusion. It's very small (2 tables and a counter with high stools), and I can't begin to imagine what kind of traffic they get on weekends and evenings (the entire St. Mark's/NYU/East Village area can be a little slice of hell when millions of skinny-jeaned college students descend in droves to the nearest bar that serves $1 PBR cans - but I'm closer to 30 than 20 these days, so maybe I'm just getting old). But I digress. I happened upon the shop in the middle of the afternoon on a weekday, and it had seats to spare. The feel of lunch-counter rapidity mixed with the comforting warm pie made for a cozy quick bite. For those of you who have never been to a Milk Bar, I will explain - it's a branch of the Momofuku restaurant chain (a series of verrrryy upscale Japanese restaurants in New York), but instead of a classy fusion eatery, the midtown Milk Bar is a small counter in the lobby of a hotel that serves a limited amount of desserts to-go. They're known for their famous Crack Pie, a wedge-shaped cookie/pie/blondie/thing that's pretty much a conglomeration of all things yummy (if you've never experienced the Crack Pie, get thee to a Milk Bar asap. But this post isn't about Momofuku or Milk Bar, reviews and articles have been written about that topic ad infinitum.). Amanda ordered said pie, but I, having slept in and not eaten breakfast yet, went for the Cinnamon Bun Pie, which I deemed as both a feasible and socially acceptable form of breakfast. It was warm, gooey, cinnamon-y, and everything a breakfast pie should be. Wait. Breakfast pie? Was I crazy? Did I just eat pie for breakfast? Which got me thinking. Of course breakfast pies exist - quiches, frittatas, and dozens of other egg-based casseroles abound in kitchens and cute brunch places everywhere. And with this new-found knowledge...I decided to make my own breakfast pie. Full disclaimer: I am not a chef. I have never taken a cooking class. I don't even have cable and therefore cannot religiously watch the Food Network. However, I frequently putter around the kitchen, I've worked in the food service industry for the better part of the last decade, and hell, I'm a Millennial! I was born in the 80's! I can do anything! Whisk together eggs and cream in large bowl. In same bowl, add all other ingredients, stir together. Pour mix into pie crust, let settle. Cover with second pie crust, pressing edges together to seal the pie. Brush top crust with egg yolk [I ended up using the leftover "juice" from the previous mixture]. Bake in oven for 30-35 minutes, or until crust is golden brown. Let cool on rack before serving. The final pie was actually, if I say so myself, pretty yummy. It was a bit liquid-y going into the pie crust (eggy-juicy-spillover everywhere! sorry, amanda) so maybe I should have used less cream OR put the entire thing into a deep-dish pie crust. And it was pretty crumbly when I served myself a slice, so I probably should have let it sit and cool a bit longer (I was hungry. whoops.). But, all-in-all, for my first attempt at a breakfast pie recipe that I created myself from marrying a few other recipes I found online, it made for a successful afternoon! Welcome to Pies Etc., a blog to celebrate all things pie! The premise is simple - I love pie, and you probably do too. This city is busting with millions (thousands? dozens?) of cute/sassy/indie/hysterical places to get a slice of pie, and I am here to try them all. Oh, and maybe add in a recipe or two, some pretty pictures of pies around the world, and I promise to keep the 3.14 jokes to a minimum. Enjoy!